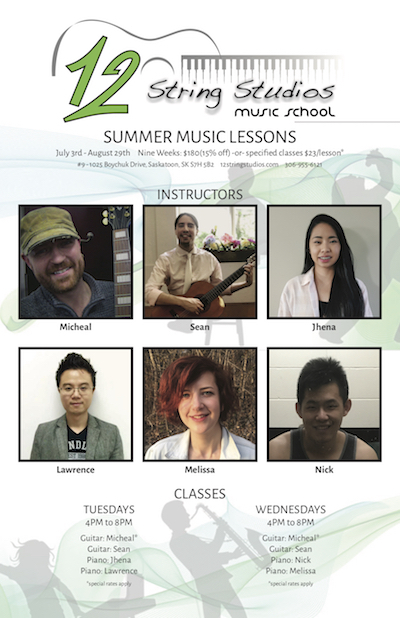 12 Strings Music School | Summer Music Lessons! Music Teacher Bios at 12 String Studios Music School SaskatoonMusic Teacher Bios at 12 String Studios Music School Saskatoon. Read more about the current Piano, B...Misc. Music Lessons at 12 String Studios Music School SaskatoonMany of our music teachers also have experience in different instruments such as base and trombone.Music Teacher Opportunities at 12 String Studios Music School SaskatoonMusic Teacher and Instructor Job Opportunities at 12 String Studios Music School Saskatoon.